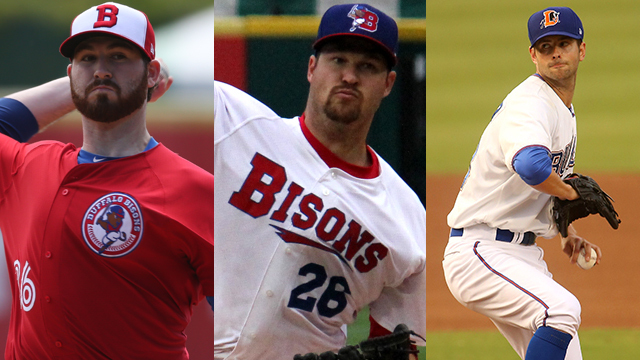 Drew Hutchison, Scott Copeland and Scott Diamond lead a deep starting Bisons' rotation. The Buffalo Bisons, Triple-A affiliate of the defending American East division champion Toronto Blue Jays, today announced their initial roster for their 132nd season of professional baseball in Buffalo, NY. Led by manager Gary Allenson for a third consecutive year, the Bisons open up the 2016 season on Thursday, April 7 at McCoy Stadium against the Pawtucket Red Sox (7:05 p.m.). CLICK HERE to download the 2016 Buffalo Bisons roster. The 2016 Bisons feature 21 players with Major League experience, including a former National League All-Star, the greatest fielding first baseman in MLB history and five players that helped the Blue Jays win the AL East a season ago. One of those players, RHP DREW HUTCHISON, leads a deep rotation where the first four starters combined to win 38 games for their respective teams a season ago. Hutchison won 13 for the Blue Jays, going 13-5 with the second-most strikeouts on the team (129). The Bisons 2014 Most Valuable Pitcher RHP SCOTT COPELAND returns after posting a 2.95 ERA in 21 games with the Herd last season. Copeland won 11 games for the Herd, tied for the 3rd-most in the International League with LHP SCOTT DIAMOND, who has now joined the team after spending last year with Durham. LHP WADE LeBLANC won 10 games with Triple-A Salt Lake two seasons ago before spending last year with the Seibu Lions in Japan. A fifth starter will be added to the Bisons roster in the coming days. Behind those starters will be a very talented infield, including 1B CASEY KOTCHMAN, whose .9975 fielding pct. in 939 career Major League games is the highest in MLB history. Kotchman hit .290 with seven home runs and 44 RBI for Triple-A Omaha in 2015. At the other corner, 3B MATT DOMINGUEZ set the Pacific Coast League record with a .990 fielding pct. between Fresno and Colorado Springs a season ago. Prior to that, he hit 42 home runs with the Astros from 2012-2014. Up the middle, INF ANDY BURNS finished 6th in the IL in hits (140) and 10th in on-base pct. (.351) for the Herd last season while INF JESUS MONTERO was a 2015 midseason and postseason PCL All-Star, hitting in 79 of his 98 games with Tacoma for a .355 average. The Bisons' 2016 infield will also feature INF ALEXI CASILLA, who played 515 games with the Twins over parts of seven seasons, and INF DAVID ADAMS, who enters this season with a career .372 on-base pct. in eight minor league seasons. INF JIOVANNI MIER had 97 hits and a .258 average for Double-A Corpus Christi of the Astros' chain last season. There's power and speed in the outfield between OF DOMONIC BROWN, who hit 27 home runs as a National League All-Star with the Phillies in 2013 and OF DALTON POMPEY, who led the Bisons with 16 stolen bases before stealing four for Toronto in the 2015 Major League playoffs. OF DARRELL CECILIANI led the Blue Jays in hits (15) this Spring and hit .345 in 70 games for Triple-A Las Vegas last season. OF JUNIOR LAKE played with both the Cubs and Orioles last season before being claimed by the Blue Jays in December. The Bisons will have plenty of late game options in the bullpen, led by RHP DAVID AARDSMA. The veteran saved 69 games for Seattle between 2009-2010 and has 142 total career professional saves. Options are the name of the game for SHP PAT VENDITTE, an ambidextrous pitcher who made his MLB debut with Oakland in 2015. RHP RYAN TEPERA posted a 1.06 ERA in 21 games for the Bisons last year and has the 4th-best winning pct. (.818) in Coca-Cola Field history, while the submarining RHP BEN ROWEN pitched scoreless baseball in 13 of his 14 outings for the Herd in 2015. RHP CHAD JENKINS has been Mr. Everything for the Blue Jays, receiving 10 promotions to Toronto since 2013 and working as both a starter and a reliever for Buffalo over the last three years. He won eight games for the Herd last year. On the left side, LHP CHAD GIRODO posted a 1.45 ERA in 45 minor league games last season and LHP PAT McCOY held lefties to a .219 average in 27 games for the Norfolk Tides in 2015. RHP DUSTIN ANTOLIN makes his Triple-A debut after being named a 2014 Eastern League All-Star with New Hampshire. Veteran leadership behind the dish rounds out the Herd's 2016 roster. C HUMBERTO QUINTERO has thrown out 33% of would-be base stealers in a 12-year Major League career while C TONY SANCHEZ has spent the last four years between Pittsburgh and Indianapolis and was the MVP of the 2014 Triple-A All-Star Game for the Indians.